Blackfish City (2018) is the cyberpunk book I’ve been wanting to read for a while now, without really knowing it. 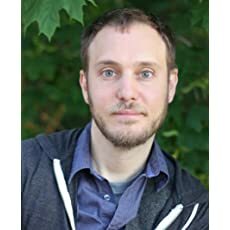 With a strange and wonderful setting, augmented humans, powerful AIs, catastrophically tilted wealth-and-power dynamics, an “information disease,” crazy-wild urban sports and vivid visuals, Sam J. Miller’s novel picks up the old baton of William Gibson and carries it into some twisty, complex post-diluvial territory. Qaanaaq, an oceanic city located north of Iceland and east of Greenland and built over a geothermal vent which provides its power, is shaped like an eight-armed asterisk. It is managed almost entirely by AIs, called “the software.” Each “arm” of the city has one elected official, an arm manager. In the background, anonymous and protected by their money, are the original shareholders. As the oceans continue to rise and billions of humans migrate, Qaanaaq is facing a problem — if not yet a crisis — of resources, as more refugees arrive each day. The latest batch are from the United States of America, and one Qaanaaq character comments that the latest USA government has just collapsed. We meet a variety of characters: Fill, a scion of wealth; Ankit, the chief of staff for an arm manager who is up for reelection, and Kaev, an aging beam-fighter who is paid to throw fights for younger, showier athletes. Beam-fighting is held on the infrastructure of the city and looks a little bit like the “American Ninja” contests or old-fashioned log-rolling. Kaev has a neurological disorder that makes linear thought (and speech) challenging for him, but he is an instinctive and powerful beam fighter. A bit later we are introduced to Soq, a gender-nonbinary street urchin. Each of them has heard about the “orcamancer,” the strange woman with the two animals. It’s whispered that she is one of the rare humans who is “nano-bonded” to animals. Many people consider them abominations, and it’s believed that most of them are dead. Ankit cares very little about the rumors of the stranger. Her thoughts are taken up with her mother, an inmate in “the Citadel,” an institution for the mentally ill. Ankit’s daily work takes her into refugee neighborhoods, and she is confronted regularly with the disease called “the breaks.” The breaks is sexually transmitted, but not solely. It’s immediately clear to Blackfish City’s reader that the breaks is a disease of connectivity and information, although what that means is not so clear at first. It’s also fatal, but Ankit knows that her mother does not have the breaks. It takes a while for the connections among the various characters to be revealed, but as they are, our group uncovers a cynical real-estate scheme and crucial data about the breaks. They plot to find and free Ankit’s mother from the Citadel. Mirroring the breaks is a pirate broadcast called “City Without a Map,” which plays a vital role in the resolution of the plot. Like old-school cyberpunk, many things in Blackfish City are not very far from today. Fundamentalism and tribalism, in various forms, are endemic. Corruption is everywhere. In a world of rising oceans, where “real estate” is everything, it’s no accident that the mystery woman arrives with a polar bear, whose habitat has melted, and an orca, just as it’s no coincidence that the name of the book echoes the HBO documentary about orcas in captivity and how they are treated. With Soq and Kaev, both of whom work for the crime-boss named Go, we see two street-level guys (and I mean that in a gender-neutral way) looking for a score or a deal, or just trying to get by. Ankit is the increasingly disillusioned public servant. Fill, like Go, is a plot device than a character, even though Fill gets his own point of view for part of the book. Ankit makes an impulsive decision early in the book that is not well-developed. Alcohol’s involved, but still, it comes out of nowhere with little foundation. I thought that a political operative who did what Ankit does would have been fired for it — immediately. Soq has a goal and refers to the goal time and again, but their motives for day-to-day decisions don’t seem quite as well-drawn either. These were weaknesses for me, but all of them are balanced by the notion of the nano-bonding, which is handled in a fresh and unsentimental way, by the mystery of the City Without a Map, and by the sheer high-octane fun of the scenes of both beam-fighting and “scaling,” a sport Ankit indulges that most closely resembles base-jumping or parkour. Close to the end, Ankit escapes a building using her scaling skills, and it’s a thrill-ride of a scene. Ultimately, although it’s not immediately obvious, this is a story about family and the different ways people make homes for themselves. When Masaaraq, who is the orcamancer, or Ankit or Kaev were on the page, there was no way I could put the book down. While I didn’t think the real estate scheme quite held up, I thought Miller delivered on his original plot premise with plenty of suspense, action and emotion. (I wasn’t always sure the “big conspiracy” in any of Gibson’s books held up and I certainly enjoyed those.) Blackfish City filled a need I hadn’t even known I had, and I look forward to Miller’s next work. Published in April 2018. After the climate wars, a floating city is constructed in the Arctic Circle, a remarkable feat of mechanical and social engineering, complete with geothermal heating and sustainable energy. The city’s denizens have become accustomed to a roughshod new way of living, however, the city is starting to fray along the edges—crime and corruption have set in, the contradictions of incredible wealth alongside direst poverty are spawning unrest, and a new disease called “the breaks” is ravaging the population. When a strange new visitor arrives—a woman riding an orca, with a polar bear at her side—the city is entranced. The “orcamancer,” as she’s known, very subtly brings together four people—each living on the periphery—to stage unprecedented acts of resistance. By banding together to save their city before it crumbles under the weight of its own decay, they will learn shocking truths about themselves. 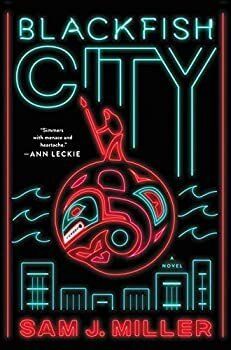 Blackfish City is a remarkably urgent—and ultimately very hopeful—novel about political corruption, organized crime, technology run amok, the consequences of climate change, gender identity, and the unifying power of human connection. MARION DEEDS, with us since March 2011, is retired from a 35-year career with county government, where she met enough interesting characters and heard enough zany stories to inspire at least two trilogies’ worth of fantasy fiction. Currently she spends part of her time working at a local used bookstore. She is an aspiring writer herself and, in the 1990s, had short fiction published in small magazines like Night Terrors, Aberrations, and in the cross-genre anthology The Magic Within. On her blog Deeds & Words, she reviews many types of books and follows developments in food policy and other topics. Well, this is definitely going on my library list. :D Great review, Marion! I think you’ll enjoy it.